Birmingham APA awards various patches to players for their individual accomplishments during League play. All teams are responsible for noting which players earn specific patches on their weekly scoresheets. Below are the links to all of the APA patches that are available in our Birmingham APA area and each patch has a description of how to earn them. Most league patches are awarded to the recipient within 2 weeks of when they are earned unless noted otherwise. To avoid delay in receiving your patch, teams must remember to clearly note what patches were earned, and by what player, on their team scoresheets the night the patch was earned. How Many Patches Do You Have? Seen by few, touched by some, possessed by only the most lucky and privileged. 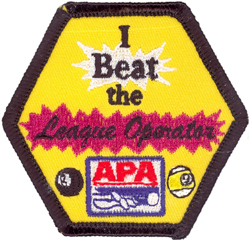 The below patch is the most wanted award by all players in every APA league throughout the country. It takes it's place with all the myths, fairy tales, and urban legends such as Leprechans, Big Foot, Loch Ness Monster, and fair cash leagues. 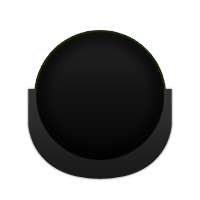 Available to all skill levels if they can handle it.